That awkward moment when someone takes a photo of you picking berries along the foot path to town and you realise OMG! I've turned into a hippy! I'm not even just picking black berries but ones people give you funny looks over as they think they are poisonous (which they are if you don't cook them!). My top was not quiet tie dye but near enough and my baby had no trousers on whilst my eldest skipped about in a hand painted t-shirt - yep I'm one of those mums - also urban blackberrying - BEWARE THE CYCLISTS! This was a post I put on facebook and some interesting things came out of it - for a start I had to qualify that I meant the Rowan berries as toxic unless cooked. But they are not very toxic as in it is something that builds up over time and can sometimes lead to liver (or maybe kidney failure) from what I've read. Anyway the chemical is broken down by temperature extremes so that is freezing and cooking. Which is why the old country lore is that you don't pick until after the first frost. Then I was asked what I thought of berrying along busy roads - which is an interesting one - this was my response. 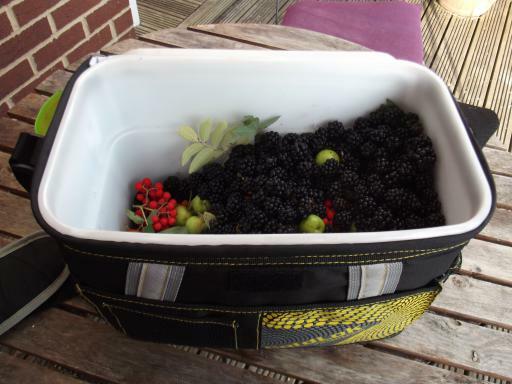 Ok when the petrol was all lead based it was a big problem but now it should be ok - some of the ones (berries I'd picked) today were from road sides - it helps that my friends did the soil surveys a few years back - only thing I would say is that they shouldn't be eaten directly from the bush still if from heavy roadsides as there will be dust on them but a quick wash should sort that out. (However be aware this is my opinion and I haven't seen any data for years). Also unless you have a map of the UK with metal ions on it etc... you are going to struggle to know what is safe where anyway - there are areas of Wales for a start where heavy metals weather out of the soil and plants there should be avoided for human consumption - add in illegal human refuse dumps and so on... Somewhere may seem nice a pleasant - even have farm crops growing on it and really not be good at all. But the risks are minimal anyway as it is build up that's the issue wand everyone eats from a wide variety of places these days. Having said all this people swapped recipes for things, and then I found out that haw stones contain cyanid - but again the cooking will brake this down - but this lead me to think about the confusing wealth of info out there on edible plants etc... I have not found an actually study of this specifically to tell the public the exact risks of things - for a start a table of how much cyanid is on average in various foods and compares say free food to stuff like apples and almonds etc... Also people seem confused by cyanid groups verses cyanid itself which react very differently - if we cut everything with the groups in out of our diet we would quickly starve (if I remember my A'level chemistry correctly). Also I have been freely dispensing information about blackberries to people who enquire whilst I am out and about and often on of a group will be really taken with the idea whilst another will have apoplexy about them being dirty etc... There is very little in the way of public knowledge about this stuff - have any tests actually ever been done I wonder? How dirty is a blackberry straight from the briar and what do the soil test etc... mean around the road sides. In the wake of Jamie Olivers comments about food and poverty and people being silly for not knowing - it would make sense to have an education program, healthy eating reduces costs to the NHS and benefits etc... it is a long term thing. People are scared of food they haven't grown up with or don't want to squander tight budgets on culinary experiments that might go wrong or really just can't get the fresh fruit and veg from the shops but also do not feel safe or confident in going out and finding their own in case they poison their family - these are reasonable fears and so easily addressed. So if I was in charge what would I do? I would have a government leaflet/website that told you all about were it legal to forage (in clear terms) and the risks set out (this is the risks not just the hazards) but I would include the same for processed and main stream farming foods. I would initiate more allotments and community orchards and let the public know the things exist! Schools are starting to grow veg and stuff thanks to the super markets and there has been an upsurge in general homestedding activities but they are being seen as a very middle class thing as they tend to be the ones with the time and spare resources to plough into learning about these things. I am finding it very frustrating trying to get hold of an allotment and to be frank most of our shopping bill is fruit and veg and that is just wrong! It is stupid that processed foods cost more than fruit and veg fresh from the field/vine. As one of my friends posted on FB recently - growing your own food has become a middle class want rather than a working class need - but the problem there is that it is really still a need for EVERYBODY regardless of income or age. I've been reading up on things like depression, stress, learning difficulties etc... all being helped by... well nature - yes I know it all sounds hippy but these are medical studies etc... I think it would need a lot of work though - most of those being pushed into poverty at the moment are households were both parents work (I know surprising isn't it?) and therefore they are not going to want the extra stress/time restraint on already tiring lives - but maybe allotment sharing could come into place or something like that. I hear that high end offices in London are now installing gardens on their roofs were people can grown veg and even keep bees. I have hope and I am enjoying my blackberrying - I've received one jar of jam from a friend and the neighbour nabbed me yesterday to shyly ask if I would like some of her 'bramble' jam once it was cool. Design experiments to test a few metrics and then put the results and methods on an Open Street Map. I need to talk to a toxicologist first I think as I'm not sure what levels of what affect humans in a negative way nor how to test for stuff that doesn't involve blasting rocks with lasers or melting them in acid first!